I had the wonderful opportunity to travel to Haiti and provide medical care through an organization called Hands Up for Haiti. This was a one week medical mission, with a team of physicians and nurses. After landing in Port au Prince, we took a short flight to Cap Haitian. On our first day, we delivered much needed medical supplies including IVs and fluids to Haiti Hospital Appeal. We traveled by road the next day to a clinic located in Bod me Limbe, which is in northern Haiti. We saw patients from newborns to adolescents. I particularly remember a teenage mother that had brought her newborn baby with eye discharge. We treated the infant for gonococcal conjunctivitis, and also treated the mother. They returned the next day and their symptoms had improved significantly. It was so gratifying to see that our intervention made a difference. On the following days, we went to different villages to deliver medical care. I will never forget how when we arrived at Sineck, our clinic was completely surrounded by patients waiting eagerly to be seen. We also hiked an hour to a remote village called Guitton. Two of our team members took a baby with apnea from Guitton back to the neonatal unit at Cap Haitian for monitoring and IV antibiotics. The following day we took a boat to Labadee and set up clinic there. 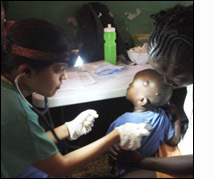 On our last day, we provided medical care in Shada, the slums of Cap Haitian. Out of all our clinics, this was the place that I saw the sickest children. They needed medical care desperately. Everywhere we went, we saw and treated patients with skin infections, parasites, pneumonia, malnutrition, and much more. My first international medical mission has been an unforgettable experience. Thank you for all your support.